Make the cherry ripple: combine the cherries, sugar, corn starch, salt, lemon zest and juice in a saucepan over medium-high heat. Bring to a boil, stirring occasionally, and boil for 1 minute to thicken. Set aside to cool completely, then refrigerate for at least 1 hour. Frozen yogurt: mix the ingredients together in a medium bowl, stirring until sugar is dissolved. Refrigerate for at least for 1 hour, then freeze it in your ice cream maker according to the manufacturer’s instructions. 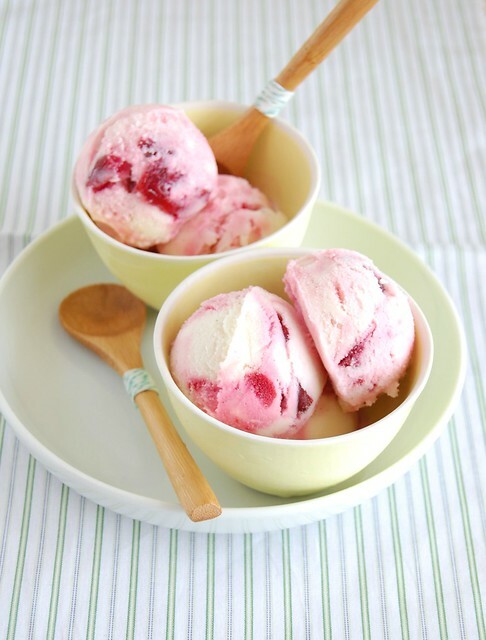 As you remove it from the machine, layer it in an airtight container with spoonfuls of the chilled cherry mixture. Freeze. Beautiful! I'd love to indulge in this for breakfast. I'm counting down the days until the kitchen is flooded with cherries again. I love your pictures! They really make me want to go now and whip some ice cream! this looks so fresh with clean tastes and flavor..love it! will remember it for summer when my cherry trees are hanging with fruit.. I love this book from David Lebovitz (the perfect scoop) ; thank you for this quick ice-cream recipe and happy new year to you and your family !